Embrace the taste of the season with these fruit-filled, protein-packed waffles! One thing I absolutely love about cooking with protein powder is the fact that you can easily incorporate all sorts of fruits and veggies into your dish. What you end up with is delicious yet nutritionally potent, protein-emPOWered meals and snacks. 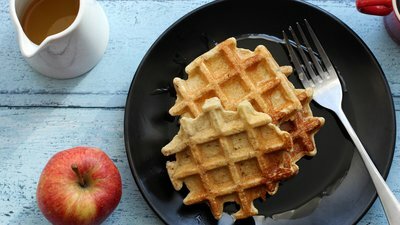 Right here are some protein waffles that contain both a whole fresh apple and a banana! In addition to adding fantastic flavor, the fruit ensure that your waffles stay nice and moist. The only trick to using fruit in your waffles is making sure that you have enough dry ingredients, preferably of the flour family. You really have to pay attention to this, because if you don't, you'll end up with a batter that's more like baby mush than waffle batter. You definitely don't want that. If you want to take your waffles up another notch, consider including additions like chopped walnuts, pecans, or dark chocolate chips. You'll add a nice texture, flavor, and if you go down the nut route, some crunch, healthy fats, and fiber. When it comes to toppings, the sky's the limit! You can go classic with honey or maple syrup, go low-carb with peanut or almond butter, or add some extra protein with a side of eggs, ham, or bacon. Spice this dish up with your imagination—anything goes! Anna's passion for exercise and nutrition inspired her to create proteinpow.com while she was still in the last year of her Ph.D. program.